1. Find a Moroccan-ish shape you like online and print it out whatever size you want (Google images is a good place to go). The larger you go… the less work it is. I had to tile mine onto 4 sheets of paper, then tape them together. Don’t worry about the design being all blurry if it is, you can fix that in a minute. Once it’s all taped, fold the paper in quarters and cut out your shape. When you unfold it, you will have a symmetrical pattern even if it started off blurry. Here is the shape I used if you want to do the same. 4. Pick a spot on your wall to start tracing lightly with a pencil. 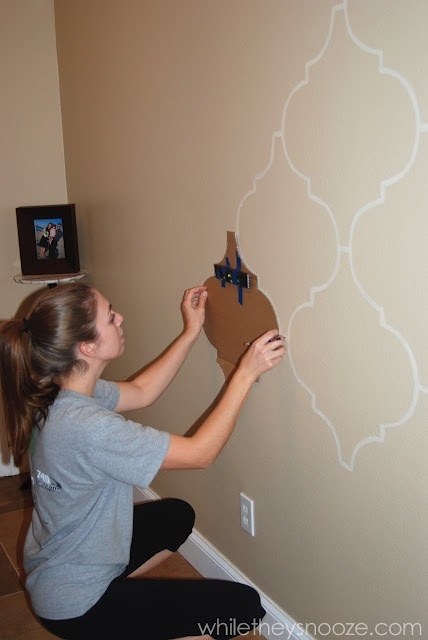 I eyeballed where my stencil would end up on each end of the wall and made sure I started in a place that would have me end in a half pattern on each side. Did that make sense? It really doesn’t matter. I just preferred no tiny slivers on the sides. 5. Once you traced everything with a pencil, (took me a few nights while they snoozed) grab a small brush and go over the lines with paint. That’s it!